So Hubs and I have decided that October 2nd (the LSU-UT game at LSU) will be the perfect date for a housewarming/gameday party. I'm super excited because Hubs wants to send out actual paper invitations (obviously my preference). I might even use paper plates as a compromise! Paper versus our (everyday) china is a hotly debated topic in the Spice and Sass household. Why is putting something in the dishwasher anymore arduous than throwing it away? Baffling. And wasteful. 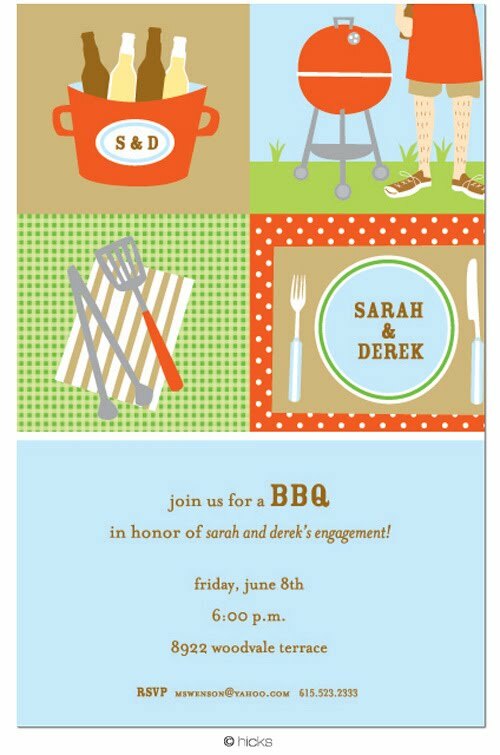 Anyway, I have already started scouting invitations (I realize that I am a psycho. Even more psychotic is my initial outfit planning). Look at all of these- which do you like best? 1) Shot glasses- incorporate football, drinking and Orange. 2) Bloody Mary- perfect for an early game. Also incorporates football, drinking and orange. 3) Plaid- features fall and Orange. Maybe a little bit more elegant? 4) Owl- Orange and fall, plus I really dig it for some odd reason. Hubs will hate. 5) This one is a front-runner- Orange, drinking, grilling out (we are planning a rib-off between two of our accomplished-grill master male friends). Maybe too summery? Although the first of October will likely still be hot. . . So which is your favorite? And what should I wear? (hee). As a huge Football person I vote for the shot glasses! 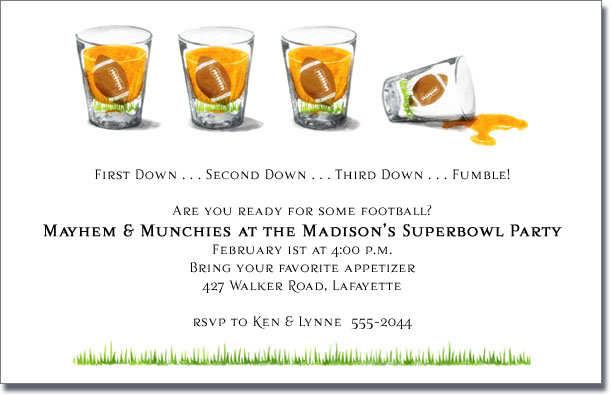 So funny and cute!Perfect for a fun housewarming centered around football! I'd love to know where you found them too! i like #1 and then #3 the best. so cute! Not going to lie. I ADORE the first one! But they are all quite cute. I love invitations. I really like the first one, although I can see how the last one is a front runner too. It does look a little summery but in the South it's warm until nearly Thanksgiving! Love the shot glass one! But they are all cute! My favorite is the last (although I'm always partial to owls, too!) - I don't think it's too summery at all... all the orange makes me feel very "Early Fall!" Hands down, go with the first one. LOVE IT! Love number one and it screams Spice and Sass to me. You could print up little "cocktail flu recovery recipes" as giveaways. So cute. I am in LOVE with the first one! My hubs is a UGA grad and we always host football parties...I'd def use the shot glass invite! I am so excited for SEC football to begin, though I bleed burnt orange from the great state of Texas! With the rest of the fam being UGA grads, I definitely wear the red and black too! I love, love, love the firs one! It's super-cute. And I would be starting to plan, too, so you are definitely not psycho - you just want everything to be nice. And stand your ground on using the everyday china, I say haha! OMG why are the hairs on the legs in the last one so perfectly in a row? All of the invites are too cute! Definitely the first one! Unique, cute, and perfect for football season!! Love the first one! If it helps your plans, most games in Death Valley are night games. I have been planning my football season fashions for the past few weeks, and plan to host at least one party at our home for all my Gator friends displaced in DC. It will probably serve as a house re-warming as well since we will just be moving back in after the remodel. I don't understand why my husband doesn't seem to think that my game day dresses are a necessary expense along with airfair, hotels and tickets-to me that's just a given. Last one is definitely my favorite! And you're most definitely not crazy to be planning your outfit already. The first thing I think of when I plan an event is "what will I wear?" Shop on sister! I like the plaid. 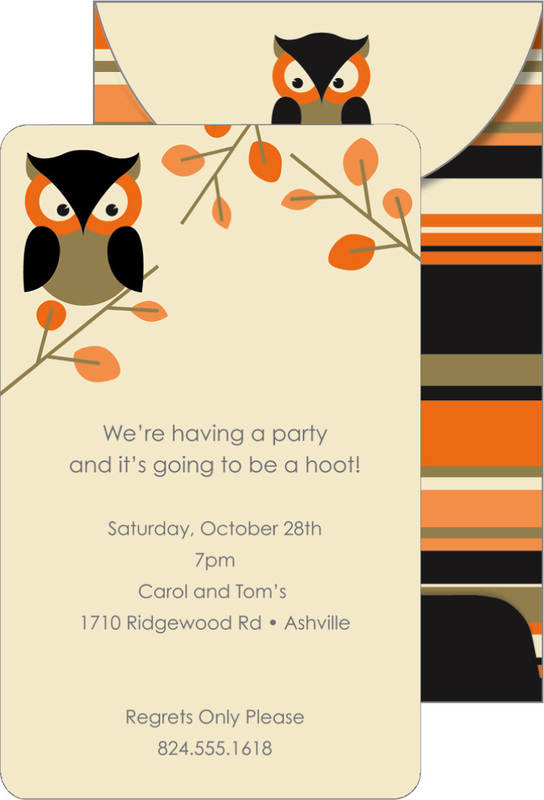 Orange for your team, plaid for fall and it's a bit sophisticated which will be nice for your housewarming party. Have fun! So I am a little late with this, but I LOVE the first one! It is super duper cute! Hope you are having fun getting settled in to your new abode. The Square misses you! So did you choose a design yet? 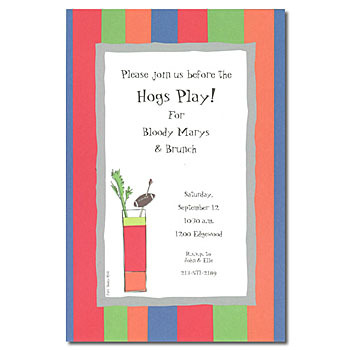 & where did you find these cute invites? my Googler must be broken..